Home > Blog > What Is Green Coffee Extract? We have already detailed some of the health benefits of caffeine, but we have yet to go into depth regarding the sole ingredient of GreenCoffex® - green coffee extract. On a recent campus handout, several students looked at the brown time release granules in the capsule and asked, “what is this?” Well, that’s a great question and we are here to clear up just what exactly is in this natural energy supplement. Green coffee extract, in its simplest form, is just as the name implies. 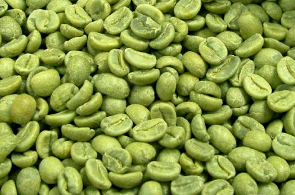 Where traditional coffee is made from roasted coffee beans, green coffee extract is made prior to the roasting of the bean – hence the term green. Roasting a coffee bean alters the antioxidant properties, flavor and caffeine content. Studies show that green coffee extract contains levels of polyphenols, or healthy antioxidants, similar to those found in green tea and grapes. These polyphenols, in the form of caffeic acid, have the ability to help the body fight free radicals and protect the body against the effects of aging. Many consumers are not fully aware of the health benefits of antioxidants – polyphenols included. Free radicals are molecules naturally produced by the body, but the rate at which they are produced increases through exposure to smoke, stress, pollution, asbestos, radiation and so forth. Excessively high levels of free levels can lead to a harmful condition known as oxidative stress. While everybody has certain levels of free radicals in their body, increasing the amount of antioxidants in the body may ward off oxidative stress. In turn, the body has a higher likelihood of warding off cancer and other diseases and may also decrease the effects of aging. The antioxidant properties of GreenCoffex® are just one of many reasons to choose the product. With all the benefits of any other caffeine supplement, like increased energy and alertness, it’s a great choice for everyone. The product costs less than a cup of coffee and packs an added antioxidant punch that you won’t find in any cup of coffee!